It's Hannukah! Woo hoo. I really didn't even know it was Hannukah until I was visiting some of Jeremy's family and they pulled out the menorah. I knew it was coming up - and I was prepared and ready with a gift for my niece, but really, it's not a very important holiday. Just so you all know. It is very sweet that you all wish me a Happy Hannukah, and get so excited about it, but it would be as though I was calling you to wish you a "Happy Colombus Day". Significant, yes, I guess, but so much a huge holiday. That's not to say I won't accept presents. I mean bring 'em on if you really want, but you can also give me a Columbus Day present. I wouldn't complain then either. 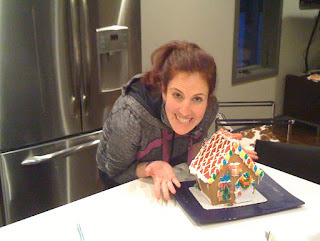 However, the one thing I do enjoy about this season, is decorating a Gingerbread house. You see, growing up I was not allowed to do such an activity, because we are Jewish. My dad thought it was inapropriate. 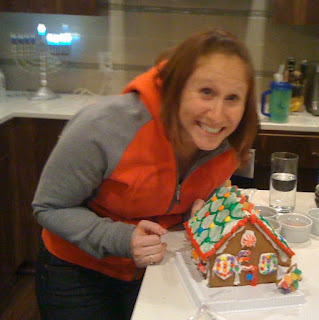 I'm not entirely sure what a house made of gingerbread and copius amounts of sugar has to do with the birth of Jesus, and thus what is inapropriate about a Jewish girl enjoying such an activity, but none the less, we couldn't do it. So now, in my adult life, I will not miss an opportunity to build a gingerbread house, or decorate a cookie. Nope, not this girl, those are IMPORTANT activities! Debra's handiwork. Please note the spectacular work. This girl is on her way to Ace of Cakes. This house rocked. Kara's Masterpiece. It started out a little challenged. I thought I would make a 'Green Roof' - like energy efficient, but also green...the color...get it? It was going to be cute, but well, they didn't give us enough green frosting, so it became a multicolored roof. Now look at those faces of glee. The face of glee, with a Menorah in the background. Woops. Should have moved that for the Gingerbread house shot. Find joy in the simple things in life.